THE FARMHOUSE This post is sponsored by Leesa, a company we have used and loved for years. Thank you for supporting the brands that support the Grit and Polish. Use discount code GRITANDPOLISH when you checkout at Leesa! 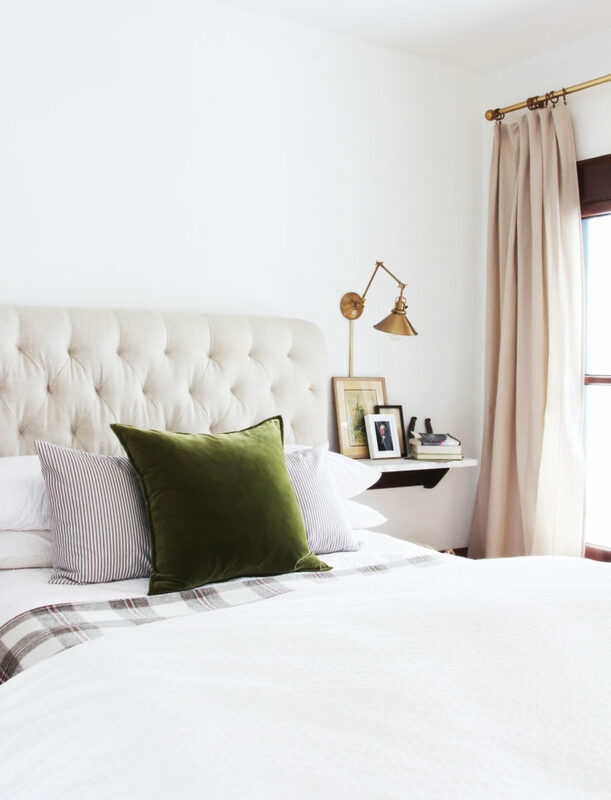 Our Farmhouse master bedroom has seen a lot of small, seasonal changes since we first decorated it last Fall. And this winter is no different. We made a few changes. Nothing ground breaking. Nothing too flashy. Just a few minor updates to get us through the long, Washington winter. Despite the fact that Garrett and I own 14 mattresses - 5 at the Farmhouse and 9 at our rentals - we were still sleeping on the very first mattress that we bought together. It was 13 years old and well past it's prime. So we upgraded to a Leesa foam mattress and we love it! But we knew we would because we already own 4 Leesa mattresses, including one at our Dexter House Airbnb and both of our boys' beds at our Farmhouse. We first tried Leesa on a friend's recommendation a few years ago and now we're excited to be recommending them to you. Not only are Leesa mattresses comfortable (our Airbnb guests have seconded that! ), but they're made in the USA and don't contain toxic flame retardants. Plus Leesa offers free shipping/returns and we love that you order online and skip that awkward trip to the mattress store. If you're in the market for a new mattress, use code GRITANDPOLISH for $100 off a Leesa plus if you order by Presidents Day they'll up that to $125 off and throw in a free pillow. Pro tip // for narrow staircases and awkward bedroom entrances, Leesa's boxed mattresses make for easy installation! In addition to the new mattress, we've added a wool blanket and down comforter over top of our year-round cotton quilt because it gets cold in the Pacific Northwest. Garrett and I actually love sleeping in cold rooms (and saving on energy bills ;), so we keep the house heat at 60 and pull up the blankets (the kid's rooms have space heaters). One purely-aesthetic change we made was to bring in some masculine elements. I really wanted this room to appeal to its male occupant as much as it does to me, so I layered on the blue-ticking and green velvet throw pillows (the former were made by my mother and the later was a gift from Rejuvenation last winter). Truthfully, the throw pillows don't always make it back on the bed in the morning - three young kids equals chaos in the early hours - but we do try. A made bed just makes for a better day, you know?! I also brought in some vintage and nostalgic art for Garrett's side of the bed. The windmill prints have always been here, but the soldier and George-in-glasses print are new. The former is from my great-grandparents and the later a free download that I printed (see resources at the bottom of this post). And lastly, the rusted horseshoe, which I found in our garage, adds a dose of texture to Garret's marble-topped nightstand. Long time readers of the Grit and Polish might be wondering where Wilder's sleeping bag is. Well our oldest son has (finally!) been sleeping through the night pretty regularly, so we rolled it up and stored it away (you can read about that here). We also moved our Skyline rug down to the living room. It's still a favorite rug and as much as I LOVED it in here, it definitely felt feminine for this co-ed space. So now the whole family gets to enjoy it for playing and dance parties in the living room. I'm hoping to find a replacement soon. It's my philosophy that good design means a room works for us and not the other way around. For our bedroom, that means a comfortable place to sleep and a relaxing and simple environment that can grow with us over time. If you're in need of an easy change this winter (or spring! ), try swapping around your throw pillows or blankets or bring in some fresh art (like Melissa's free print or something vintage). And if you're in need of a more comfortable night's sleep, we highly recommend you check out Leesa. Previous versions of this room: original / ORC reveal / the toddler sleeping bag that saved our sanity / home birth and co-sleeping.